Experience winter in Iceland like a local by going off the beaten path in a modified Super Jeep. The winter time sets the scene for amazing adventures, if you have the right vehicle. On this 2-day getaway, our experienced driver guides use their modified 4x4 Super Jeeps vehicles to take you off the beaten path. You will drive past snow covered volcanoes, mountains, hills and craters into the ruggedly beautiful South Highlands of Iceland. 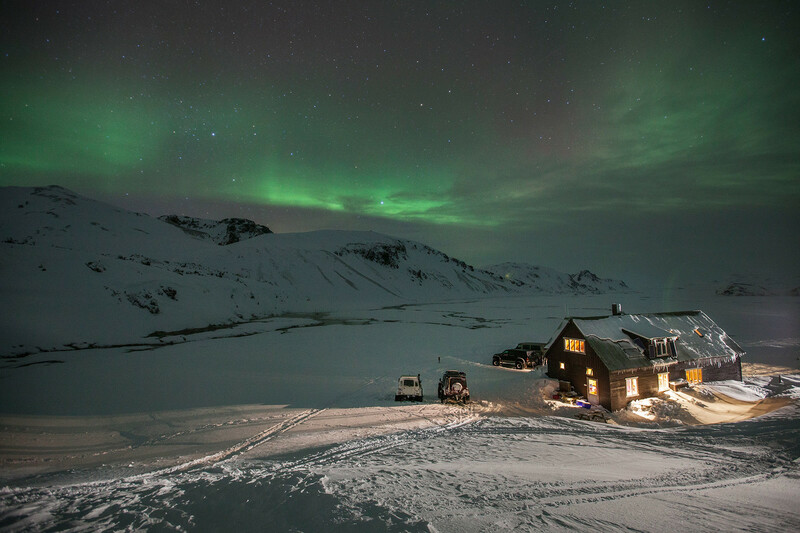 You will witness the steamy geothermal area of Landmannalaugar, the third largest geothermal area in the world, and the famous Golden circle on the way back to town. You'll marvel at the beauty of the Northern Lights* dancing across the starry sky, soak in a natural hot spring and see breathtaking half-frozen waterfalls. This will certainly be a winter weekend adventure to remember. *The Northern Lights are a natural phenomenon and therefore sightings can not be guaranteed. I am a vegetarian/vegan/gluten intolerant, will there be a food option for me, what is it?